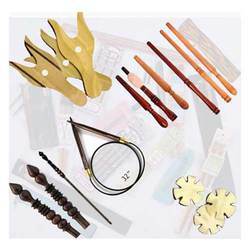 Offering you a complete choice of products which include pearl inlaid knitting needles, rosewood yarn winders, wooden wands, knitting needles, knitting needle and yarn winders in rosewood with pine wood. 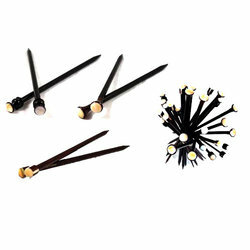 We manufacture Pearl Inlaid Knitting Needles. 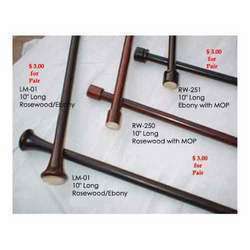 These are made of different materials like rosewood, multiwood, ebony wood and blonde wood. Our knitting needles & crochet hooks are also considered to be the best in the market for their strength, lightweight and long lasting character. 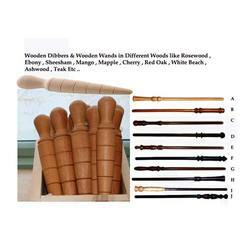 Rosewood & Kemp wood yarn winders in rosewood & kemp wood are available in our inventory. These yarn winders can be used to make Yarn in balls. 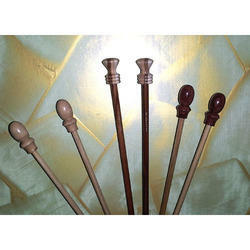 Rosewood circular knitting needles & Rosewood single point needles with turned end are also comes in our Hot Products . The other ones are bone thread winders & wooden lucets . 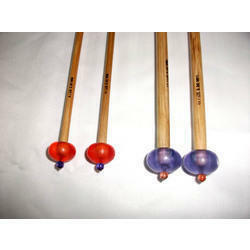 Our state-of-art facilities also enable us to offer a wide variety of Dibbers & Wands. 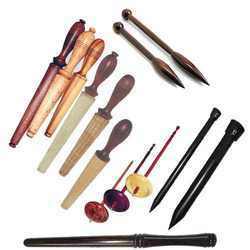 These wooden Dibbers & Wands also known as lightweight tools. These are a perfect blend of style and utility and therefore are indispensible part in everyone’s life. Adhering to the requirements of our clients, We offer tailor made solutions. We present our range of needles in various attractive packaging to our clients. 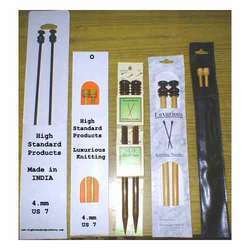 Made of quality material, these needles are light in weight and available in different styles and sizes. Highly stylish and elegant, these can also be customized as per the specific requirements of clients. Beautiful handcrafted yarn winders in rosewood handle & pine wood shaft . Very smooth in finish & light in weight . 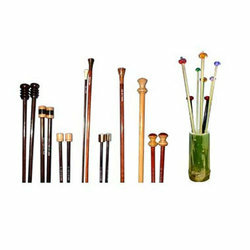 This is a collection of our knitting needles in wood , the mother of pearl is inlaid into the wood very generously . Our artisans made a difference in the history of knitting needles . These are our hot selling products . 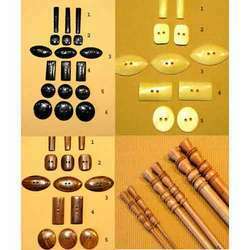 We offer different types of top knobs for our knitting needles in Rosewood and Ebony & other woods as well as for metals too. Our products are very famous in united states, People like our Quality & Prices. 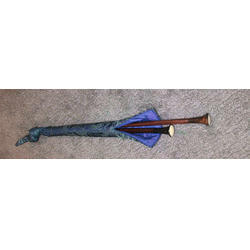 These are manufactured using high grade raw materials from reliable vendors. Additionally, we can customize these as per the requirement of our clients. 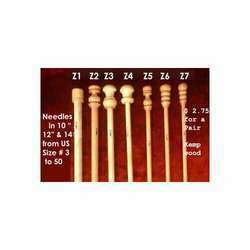 We provide a unique range of Surine Wood Needles and Buttons in bone, horn and rosewood. Elegant in look, these are appreciated for smooth finished and stylish looks. Convenient to use, our range of needles are available in varied shapes, sizes and designs. 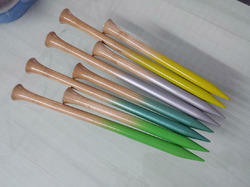 Bamboo knitting needles with acrylic colorful top end, light in weight - Reasonable prices . The length and thickness of these needles depends on the yarn used. 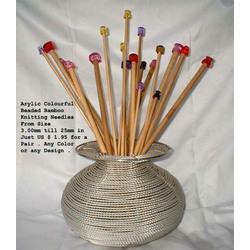 This is also called knitting sticks, knitting pins, knitting wires etc. These are the most common needle used for knitting. Manufacturer of needle with sleeves. 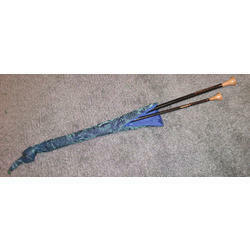 Looking for Hand Knitting Needles ?